You’ve been asking for it. We did it! 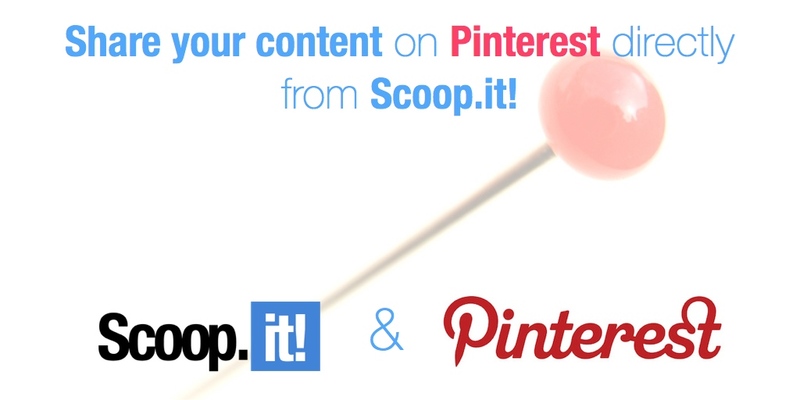 Now you can also share your content on Pinterest! 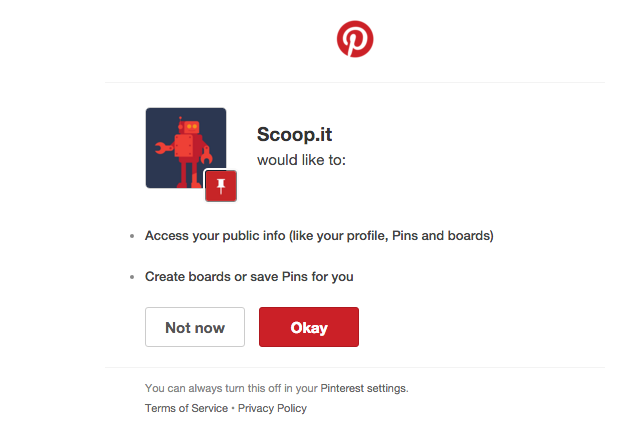 NB: You can also do this if you are a Scoop.it green user. Simply go into your Settings and click “Sharing Options” (more detail here). Whether your blog is hosted on WordPress, HubSpot, Drupal (or others), all of the content that you draft, schedule or publish on your blog now appears in our content marketing database. 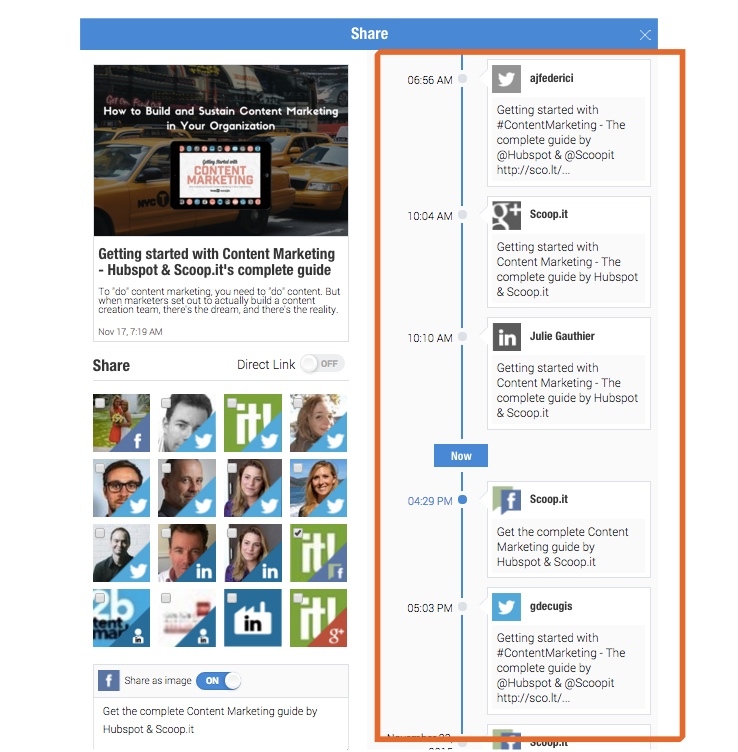 You can share any blog post to all of your social media channels (including those of your co-workers) in just 2 mouse clicks. Simply choose the post, then click “Share”. Don’t want to send all your social media messages at the same time? 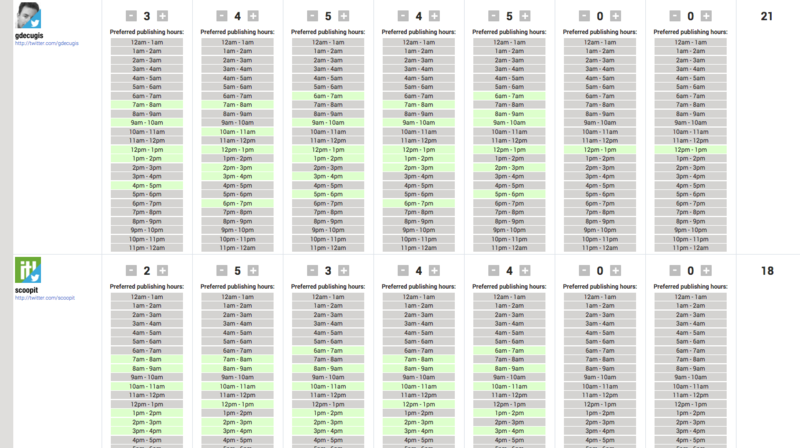 Want to save yourself some time and avoid the need to manually pick out an entire hour for each message you schedule? 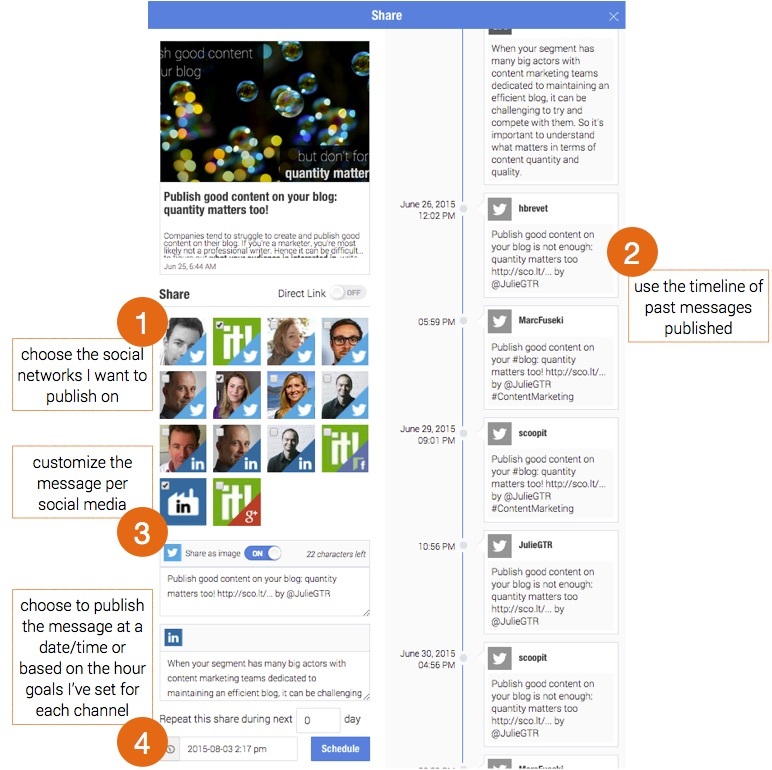 Now, you only have to set your publishing goals once (the number of messages each day per channel), and enter the hours you’d like to publish for each channel (great if you have team members in different time zones, or if you know the optimal times to publish on Facebook, G+, LinkedIn or Twitter). Radio DJs have to play new songs multiple times before they become hits. They also replay back catalogue, evergreen content years and years over. So why shouldn’t you follow suit as a content marketer? Over the past few weeks, our interactive Content Marketing Grader has revealed that about 65% of content marketers don’t re-publish their blog posts multiple times on social media. That’s a considerable number for such an efficient practice that has been proven to work. Of course, we all know why: it’s too time-consuming. So we’re solving this by making things easier for you. How? 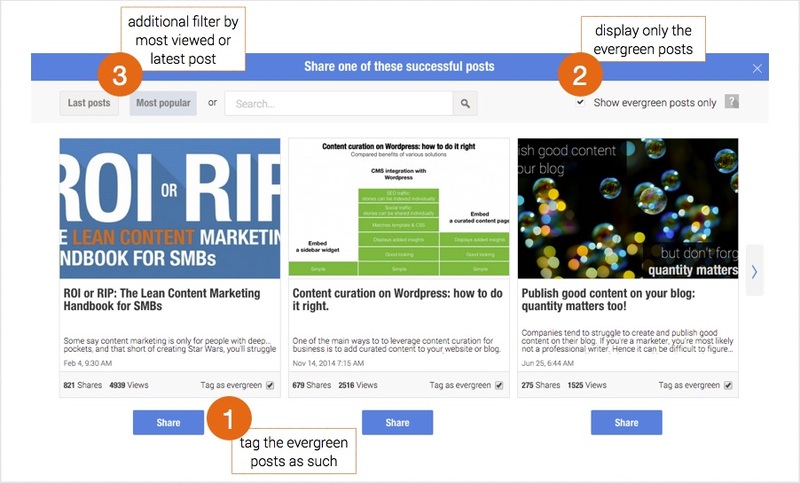 By streamlining the process so that it takes only one click for you to pull up your latest, most successful or evergreen content from your HubSpot blog. 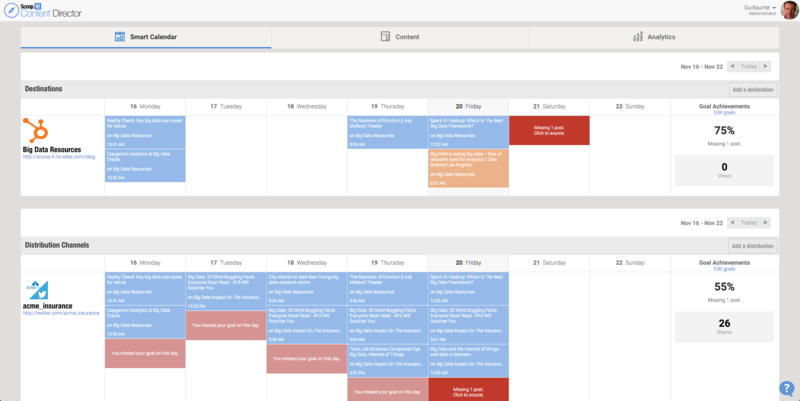 Simply select and hit Share: the Scoop.it smart calendar will take it from there and you’ll be rocking like a content marketing rockstar DJ in seconds. What message for each channel? Tired of having to constantly go back to Twitter to find the latest message sent for each post? Are you frustrated with having to repeatedly go back to LinkedIn to figure out which message had the best engagement rate? Again, we’ve got you covered. 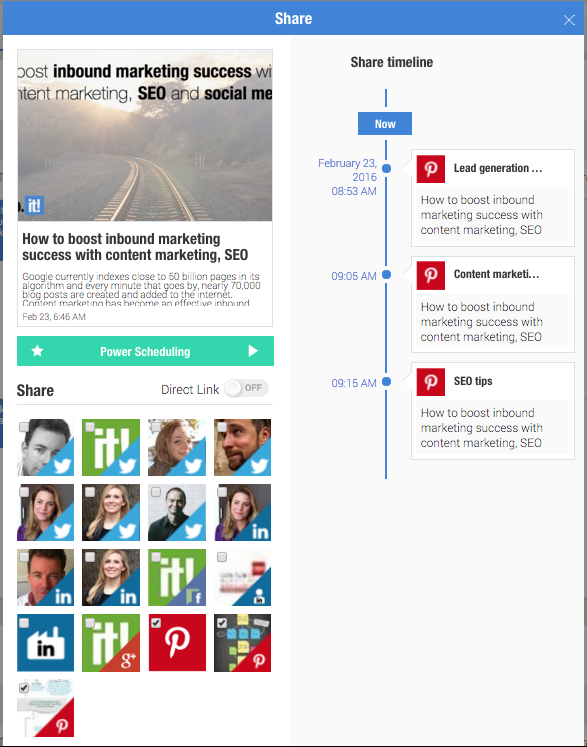 When you want to publish a blog post, we’ll display the entire history for all the previous messages sent. Simply copy and paste the one that you like, and voila! The hashtags and mentions are already there!